I've been thinking about our bedroom for a while, and it's the last room upstairs that needs a bit of a redecorate. Both of the boys rooms are so perfect for them, I love being in there so I want the same for our bedroom. I want something that will be fitting no matter what season we're in, so neutral was the way with a monochrome theme. It needed to be stylish and sophisticated, whilst still being cosy and comfortable. I've got a board on Pinterest dedicated just everything and anything I'd love to have in my room, including all my inspiration so make sure you check that out here. 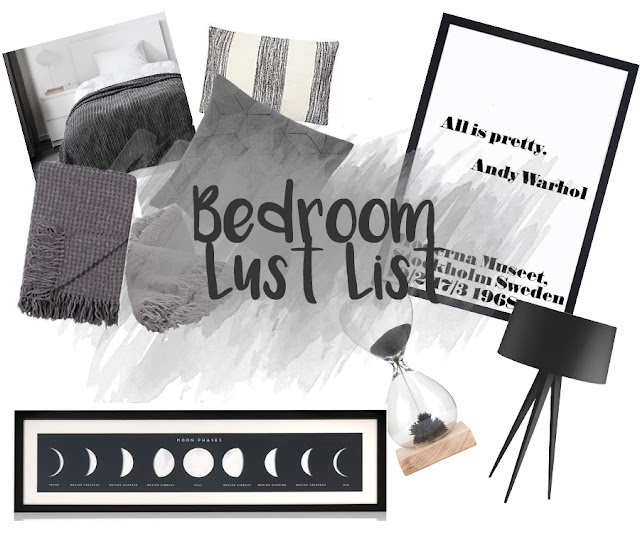 My most loved products in this lust list, are the two prints, particularly the Moon Phases artwork from Oliver Bonas, it's so classic and would be perfect above our bed with a little shelve underneath. To get that cosy feel I really want, I'd layer our bed up with blankets and throws, although I'd probably avoid the million cushion situation as I just find them annoying when making and unmaking our bed - a couple of scatter cushions is perfect for us. What 'theme' does your bedroom have? I totally agree, I hate having to make a bed with 1000 cushions! Ours is kind of the same which is why I'm so desperate to give it a shake up! Aren't they beautiful? Be sure to post pictures when you do!